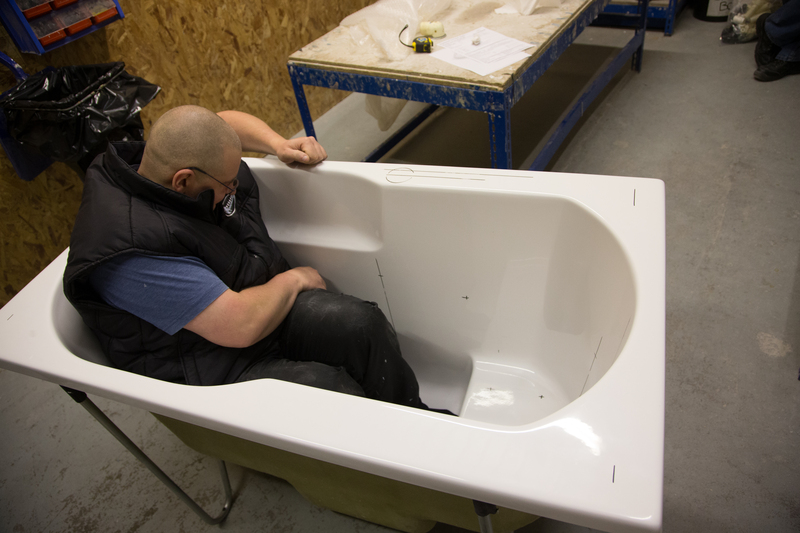 All our deep soaking baths are manufactured in the UK, dimensions refer to the bath tub and can vary slightly due to the manufacturing process. Allowance should always be made for the legs and waste which will add to the overall height of the bath. These excellent deep soaking baths have been installed in lots of bathrooms in lots of different ways and have proved very popular where a shower is required during the week, but bathing is still enjoyed at the weekend. The baths can be sunken, partially sunken or have some form of step to aid access into the bath. We have seen tiny bathrooms in London flats where the WC is used as a step! Installation can take many forms depending on the space available. In Flats where space is at a premium, deep soaking baths have been installed as a shower bath. 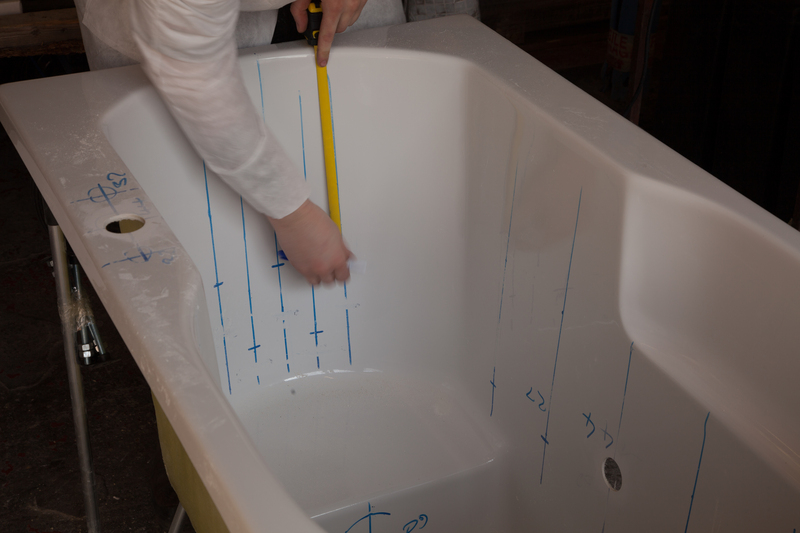 the depth of the bath does require a step to get into the bath unless it is sunken into the floor. 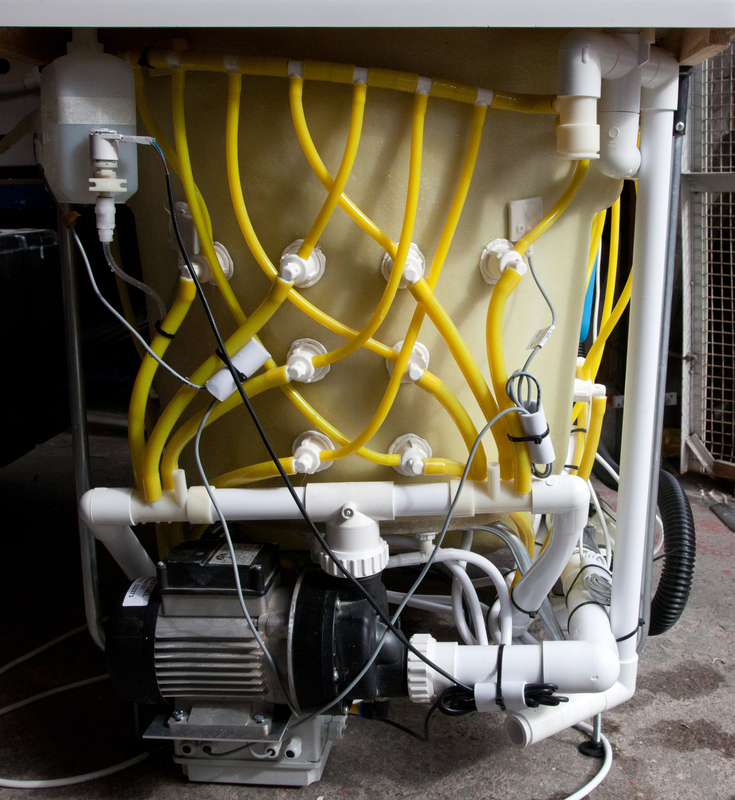 Again ingenuity takes over and several installations have been seen where a small step is installed alongside the WC allowing the bather to easily step up and onto the bath seat. 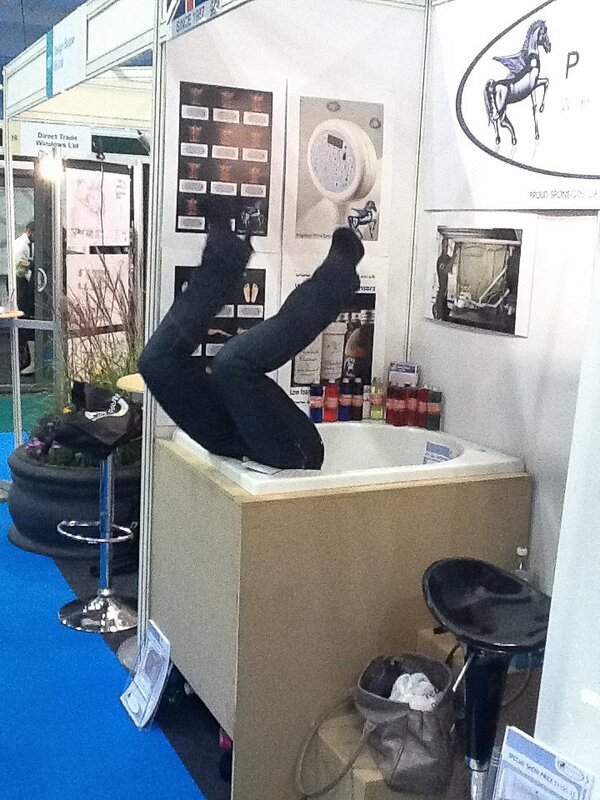 Any one who has visited our stand at Grand Designs will undoubtedly have seen Hayley stepping into the bath from the floor – not many people have legs that long though! Click here to see a 360 degree image of an Oronsay deep soaking whirlpool bath with 36 jets (24 Turbo charged whirlpool and 12 spa). 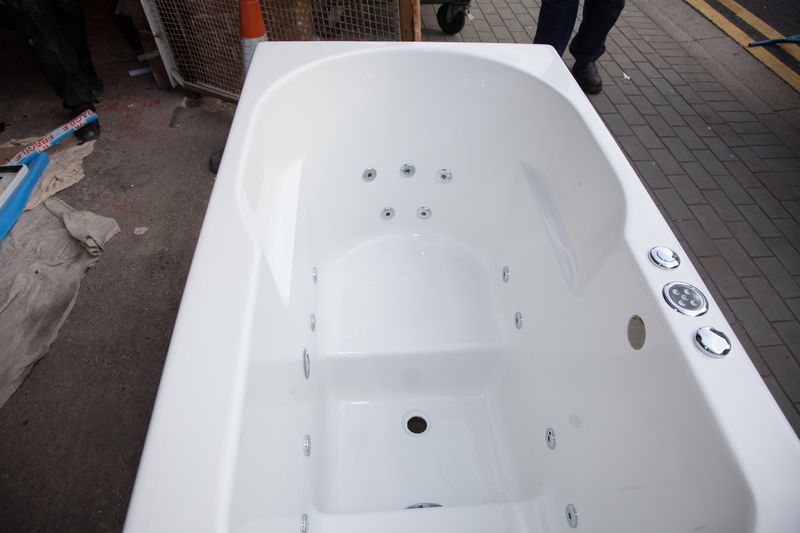 The bath above is fitted with Pegasus Flush-jets and 4th generation pipework technology. Haydn putting the finishing touches to an Islay deep soaking bath on water test. Note the natural drainage from the 4G pipework! Hayley showing a customer how difficult it is to put the plug in the waste on a deep soaking Oronsay bath – the customer was convinced and opted for our Pop-up-waste! Note the steps at the side of the bath to make access into the bath easy. We also make deep soaking baths with doors! 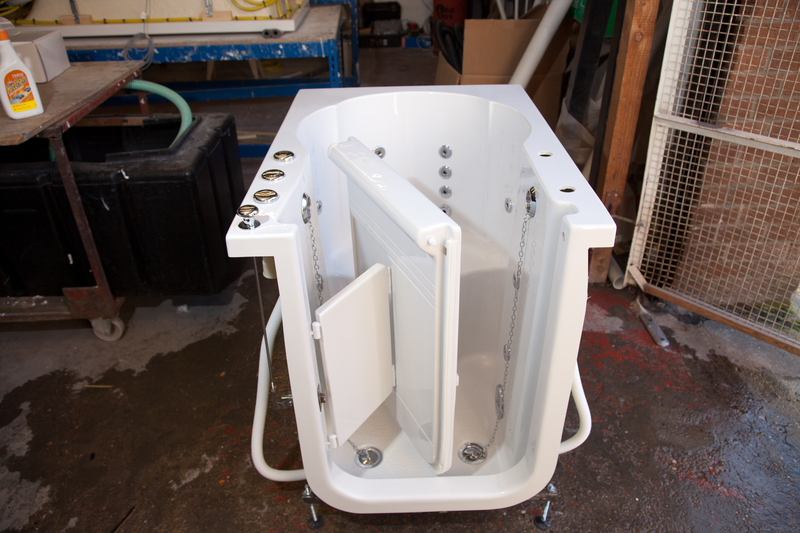 If you don’t fancy climbing over the side, why not look at one of these – Available with or without a Pegasus Whirlpool system most baths have a double drain waste to make emptying the bath quicker than normal. 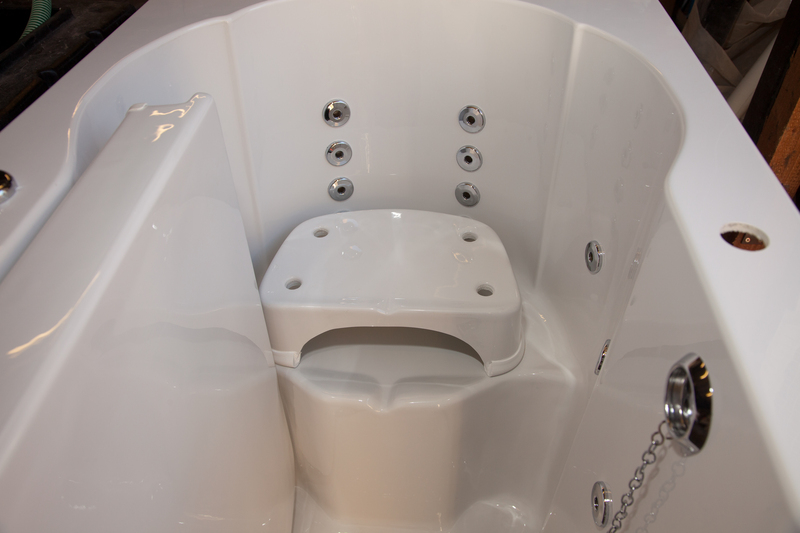 Unlike the traditional Japanese deep soaking tubs we put a seat in our baths to make it more comfortable and easier to get up and down. If you have difficulty getting up from our standard seat, we can provide a simple solution to make the seated position even higher! 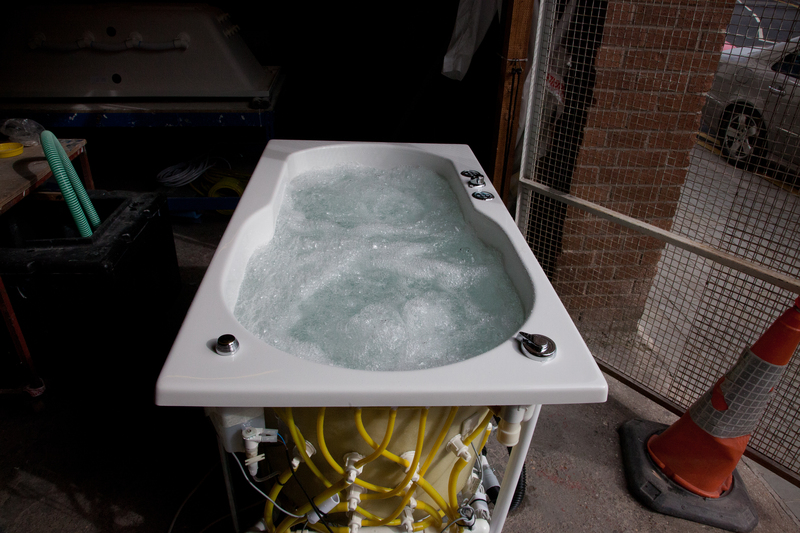 A deep soaking bath and a turbo-charged whirlpool with spa (Hydro-pool) really does make the most of the water in the bath – everyone loves the effect of so much aerated water in their bath. All the pipework and the pump fits within the confines of the bath – please remember to allow for access when designing your bathroom – we can overcome most awkward situations if we know how the bath is being installed. This is the conventional way of determining where the jets are going to be installed. Once this is done, then we speak to the customer and see what tweaks they require, if any. Fitting bespoke systems requires a lot of thought – it also helps when we have a technician who is the same size as the customer. We start with detailed images with the customer’s requirements but even so, Mike will usually have more than one conversation with the customer to make sure everything is exactly as required. 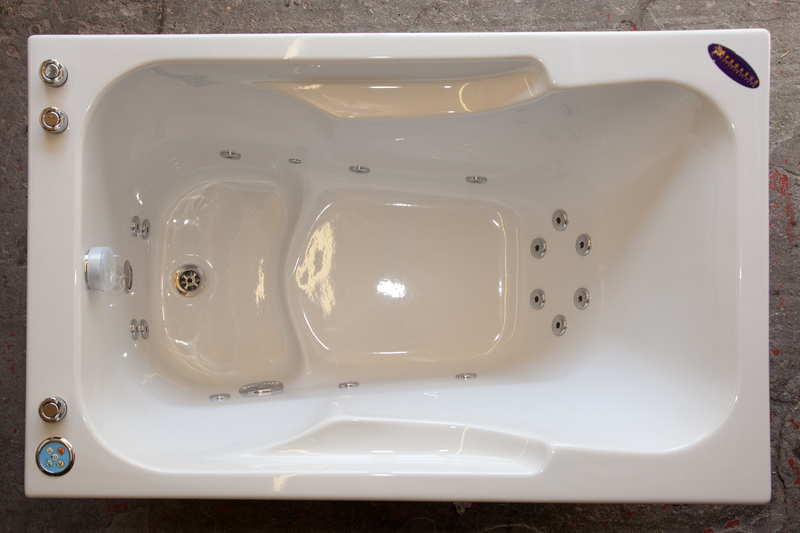 This is an Islay deep soaking bath with an intermediate system installed – side and back jets are pretty much where we start with deep soaking baths and generally, we tend to find a lot of our customers suffer from back pain and really benefit from the long straight back section of the bath where we can install a multitude of patterns to massage all the important areas!